David Yassky, commissioner of the New York City Taxi and Limousine Commission, wants you to weigh in on what matters to you in picking the winning design for future NYC taxis. Commissioner of the New York City Taxi and Limousine Commission David Yassky discusses his new job and answers questions from cabbies. 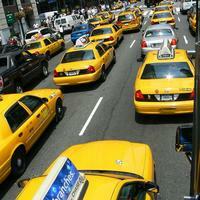 If you work behind the wheel for a living, driving a yellow cab, we want to hear from you! Today and tomorrow, Brian is interviewing the Democratic candidates running for New York City Comptroller. Up first today, conversations with candidates John Liu then David Yassky, who will each discuss his qualifications and stances on the important issues. The Dock Street development project in DUMBO faces a City Council vote tomorrow. If approved, an 17-story residential complex would be built right next to the Brooklyn Bridge. David Yassky, City Council member from the 33rd District in Brooklyn, discusses his opposition to the Dock Street project. David Yassky, City Council Member from the 33rd District in Brooklyn, joins us in studio to talk about the Bloomberg Administration's latest effort to make NYC taxis fuel efficient and environmentally friendly.